Son and Holy Ghost more commonly known as the Trinity. You may think it strange that I was only introduced to this God in such a comparative short time considering my age. From birth I was raised as a Christian, a Church of England Christian and at the age of eleven I was confirmed into the Faith after having studied the Bible and other religious books. I certainly believe in God and truly thought that Jesus Christ was indeed the literal Son of God. It was what my parents believed and their forefathers before them. I had no reason to doubt them, at least at that age. As I grew into my teenage years I could not understand the Christian dogma of Father, Son and Holy Ghost, more commonly known as the Trinity. No one could explain to my satisfaction why there had to be three persons who represented one God. In my twenties, I became more attracted to the worldly life, marriage and my employment. I still believed in God, but one God and not the Trinity. I very rarely went to the Church. In my mid thirties I became disillusioned about the state of the world, it seemed to be in such an upheaval with wars, famines, industrial unrest, poverty and most of all immorality and greed. The world was rapidly changing, changing the course of people’s lives, although sometimes not for the better. At this age my thoughts began to contemplate the real purpose and meaning of my life. What was I doing on this earth, why was man created in the first place and was there truly a life after death? A life in the fire of Hell or a life in the heavenly paradise. The world was certainly turning but I didn’t like the way in which it had changed course. Why couldn’t men live in peace and be thankful for what they had? Why were so many people now turning to drink and drugs to satisfy their cravings or to blot out their ever increasing trials and tribulations brought about by trying to chase after worldly things? One day I turned to God and prayed for Him to grant me a true friend who had the same sort of utopian ideals as I had; where one day, man could achieve peace and satisfaction in his life and to treat his fellow man with dignity and respect. These were utopian ideals, but never the less they were what I wished for and therefore I most humbly requested God to grant me such a friend who shared these sentiments. Some months later, my aunt, who lives in Scotland, got in touch with me. She is a very staunch Christian belonging to a sect that strictly pursues Christianity according to the teachings of the Bible. They believe in God and that Jesus was and is His only begotten son. They also believe that the Bible is the literal word of God and has not been adulterated by man. She persuaded me to start reading the Bible once again, which I did, and we corresponded very frequently, mainly about the Biblical teaching. I thought this was the friend that I had prayed for and continued with my study of the Bible. Unfortunately she could not answer my many questions, but I persisted, as she and her sect were very genuine people. Some months later during the course of my employment, (I was a Police Officer, specialising in Forensic evidence) I was invited by a third party, to the home of the Police Surgeon, a local GP called Dr Hameed Khan, who had found out that I was interested in religion. I had known and worked with this man on a professional basis for almost ten years. He had never spoken to me about religion before and I thought it was very strange thing for him to invite me to his home. He was a man from Pakistan and was also a Muslim. He was from a different race of people. He was a very educated man and most of all he was a Muslim. My conception of Muslims at that time was that of a very dangerous and war like people, as at that time or shortly before, I am sure that everyone witnessed the fate of the people of Iran when the Ayatollah Khomeini overthrew the Shah of Persia and installed himself as head of state and imposed Islamic rule, which at that time, appeared very barbaric to me. Eventually I did go to Dr. Khan’s house where we got acquainted and spoke about our work and then casually spoke about our religion. Initially I was arrogant in thinking that I could convert him to Christianity. How very wrong I was. After only a few visits to his home, I soon realised that this was the special friend I had humbly requested God to grant me and this was the path I should take, even though it was alien to western people, especially to Christians. Little did I know at the time that we were to become the best of friends and the best of brothers in Islam. He taught me more about my faith than I knew, especially about God and Jesus and his true relationship with God. He also told me about the religion of Islam and I grew more and more enamoured with it. Islam, he said, demands belief in only one God and the Unity of God. He said Muslims must believe in all prophets of God as they are His Messengers and should only speak the truth. Islam, he said, proclaims that God does exist and we can speak directly to Him without any intermediary and God will respond to our prayers. He requested me to pray to God and to humbly request Him to guide me to the right path. To shed light where I encountered only darkness. Through time and continuous prayers to God, I came to know Him a little better each and every day. He did reply, through true dreams and guidance. I thought at first that it was all just coincidence but after a while and with so many of my prayers being answered, I knew without any doubt that God does exist and He does answer the prayers of the supplicant when he calls unto Him in all sincerity and He does guide to the right path. I had accepted Ahmadiyyat in my heart many months earlier than my actual conversion and I had recited the Kalima many times to myself, but to openly and publicly accept Ahmadiyyat, the True Islam, was another matter. It wasn’t exactly a step into the unknown as I had deeply investigated Ahmadiyyat, but it was certainly a step into a completely new life, a new structure, a new Genesis, and a completely new beginning. It was a step that I knew would change my life forever, for I also knew that having taken that step I could not willingly turn back. It was, I thought, a step in the right direction, a new life and a new beginning and resurrection from my days of wandering in ignorance. It was on Sunday 10th January 1988, a beautiful sunny morning and a very warm one for the month of January when I offered my Bai’at. I was working on the Sunday when I accepted Ahmadiyyat, but I knew the night before that the very next day I was going to openly accept. After almost three years of soul searching, Almighty God had granted me this great blessing. I went to work on that Sunday and was so excited, as a former Christian, it was a like a hundred Christmas days rolled into one. I wanted to phone Dr Hameed straight away at 8.00am when I started work, but thought that if I phoned early on Sunday morning he might not be very pleased about being woken up so I visited a number of houses in Hartlepool during the course of my work. By the time ten o’clock came around I phoned his house and asked if I could call and see him that morning. I don’t know whether he realised the purpose of my request or not but I wanted to run around straight away, I was so impatient by this time. Later that morning I did see him in his home and told him I wanted to accept Ahmadiyyat. Whether he knew my intentions or not, his wife Sajida certainly did because she was in the hallway behind the door of the room I was in. I knew she was behind the door because of her gasp for breath with joy. She was very happy. For the rest of the day I was on ‘cloud nine’ because I was very happy, I was drunk with happiness. Being a shy, introvert person, I knew I had taken a momentous step, which shy introvert people don’t usually dare to do. I couldn’t believe I had the courage to do what I did. 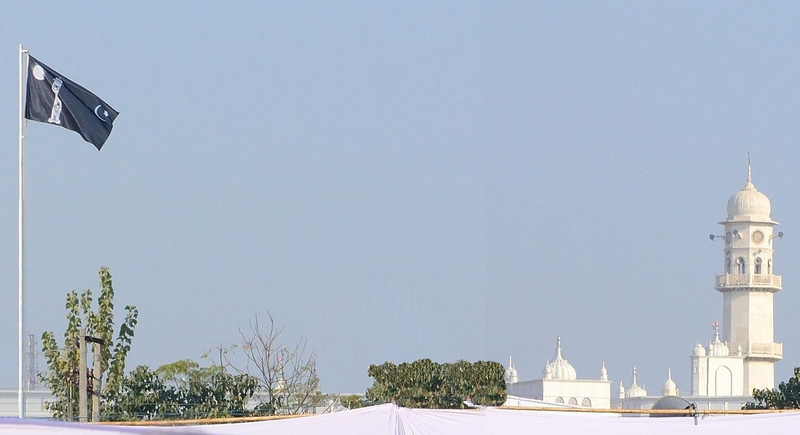 From that day forward, I promised God and myself that I would do anything, that the Ahmadi organisation asked me to do, to the best of my ability and to try in every way to fulfil all the obligations and conditions the Promised Messiah laid down for the Ahmadi Muslims. 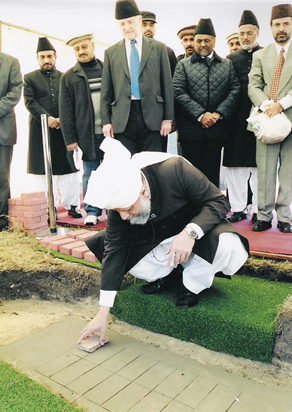 lay the foundation stone for the Nasir Mosque, Hartlepool. As I said before, it was to be a new beginning. I was free at last and not fettered as my family, friends and colleagues thought. I should have accepted Ahmadiyyat much earlier. I know that now and deeply regret my misgivings. How could I preach Islam to my family, friends and colleagues, if I wasn’t a Muslim myself? I did not realise that by accepting the religion of Islam, the Prophet of Islam, peace and blessings be upon him, and his Khalifas, especially the Promised Messiah; God Almighty pardons all your previous sins as long as you do not continue to transgress as you did before acceptance. This great blessing was therefore a new beginning, a clean start, and a clean foundation on which to build my new life. I had been spiritually raised from the dead and I can truly say, I have never looked back. Though there have been many good times and many hard times, by the grace of God I have been given strength to hold fast to this rope of Allah and have truly found peace of heart and mind. I have come to realise that this life we lead is such a very short one, even if I were to attain the age 100 years. It is a testing ground and we are being tested each and every day. Our actions and intentions in this life will determine the type of life in the next. Everything has and is being recorded about us. I believe that when we pass into the next life, this present life will seem to have been for only few moments in time. A time similar to that of the conception of a baby. That time, that conception plays a major role in the outcome of your life on this earth. We have to make a good and proper use of this time that Allah has granted us. I mentioned that I didn’t want to waken Dr Hameed on the Sunday of my acceptance of Ahmadiyyat. That particular Doctor had been waiting a long time for me to accept Ahmadiyyat. I couldn’t accept immediately because first of all I had to investigate the claims of this Doctor about his religion. Not to do so would have been the very foolish. I also knew that if I did accept it would be for life and not for a month or a year or until I found something new to pursue. However when I did accept and became more acquainted with Islam I complained to my Doctor friend that I had known him for 8 years before he even mentioned any religion to me, let alone Islam. I was in my late thirties when I became aware of Islam and Ahmadiyyat and to start learning about a new religion and a new way of life and all of its etiquettes at that age is not as easy as it is for someone in their teens and twenties. The path I had been searching for was laid out in front of me and I knew for sure, it was God who had allowed me to place my feet upon it. As I mentioned earlier, I was a very shy person and I couldn’t believe I had the courage to accept Ahmadiyyat, the true Islam. It was alien to all that I had been taught. But the teachings of Islam are so full of wisdom, logic, understanding and guidance. I had been searching for a community where true peace prevailed and this was the community, the Ahmadiyya Community, this God-fearing community, united in their Love of God and obedience to His most blessed Prophet, Mohammed Mustafa, peace and blessings be upon him, whom God had sent for the benefit of the whole of mankind and not just a tribe or race of people that other prophets were directed to address. In the end I would like to say that we should always be aware that God is watching and recording our every thought and every movement and we will definitely have to account for what we do. Many people, including some Muslims never even consider this as they pass through life without a care. It is only when they are in peril or close to death that they suddenly realise what they should have done and it is only then and sometimes not even then, when they are suddenly aware of the true meaning of the fear of God. Mr Bilal Atkinson has served the Jama’at in many posts. 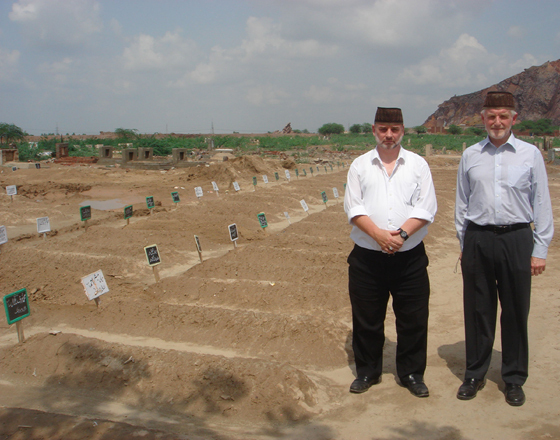 He was the General Secretary and Tabligh Secretary for Hartlepool Jama’at. He then became the Naib Sadr and then the Sadr of Hartlepool Jama’at. He was also the Regional Nazim Ansarullah for the North East and is now serving as the Regional Amir for the North East. May Allah enable him to keep serving the Jama’at to the best of his ability, Amen. that was visiting the families of the Lahore Martyrs from Tuesday 20th to Saturday 24th July 2010.